We received the dresses in this post for the purpose of review. No monetary compensation was received. All opinions are my own. Owls are so cute... who can resist them? Well, not me. And, Annabelle is certainly a fan! We recently received two adorable Bonnie Jean dresses to try out. Bonnie Jean's parent company, Gerson & Gerson, Inc., has been a family business since 1935. In 1970, Gerson & Gerson began distributing dresses to department stores under the trademark Bonnie Jean. Throughout the company’s 77 year history, they have adhered to Max Gerson’s basic philosophy: "Make the best product possible, never sacrifice quality, and maintain affordable prices." Quality is important to me, as is affordability. I mean, I am not a fan of overly priced items for my daughter's every day wear. I was definitely happy with the dresses we received. Our favorite was the burgundy color dress. It so adorable, and I love the mock-skirt look. The leggings are really nice, and I was happy that they fit Annabelle's long skinny legs! Annabelle wears a 3t or 4t depending on brand because she is so tall. These were both 3t size, and fit her well. The leggings really make the outfit "play wear", as Annabelle is still learning how to be proper in dresses. With the leggings she can run, jump, and be a little girl without having to worry about her skirt not sitting right. This adorable outfit, as well as the next, are available in Dillards stores. Annabelle LOVED the owl on this cute fleece jumper. This is a three piece set including the white undershirt, the fleece jumper, and the adorable matching leggings. I wish this jumper had been a tad bit longer, but the shirt and leggings fit Annabelle perfectly. This set can be found online at GirlsDressShop.com and Belk.com. I love that with Bonnie Jean dresses my daughter can still run and jump and play...and still be dressed girly. After all, she is our only girl and we love to have her in adorable dresses and pretty things! Those outfits are so cute I love them!! 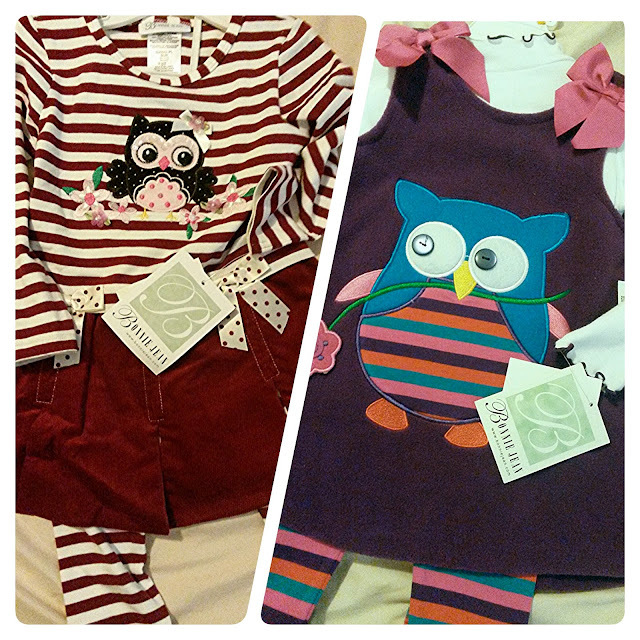 I have never heard of this brand, but we are crazy about owls and I love both outfits! Bella needs those. Adorable! I love owls! I especially like the purple outfit. Too cute!! Oh my goodness these are so so cute! I love owls.. Those are adorable outfits. I need to find some cute boy owl outfits. Oh my goodness these are way cute! I love the burgundy one!! OMGosh those are the cutest! I need to head over and see what else they have... I could use some cute clothes for Gracie.